Beloved American prize wizard Bob Barker used to give us a daily reminder to spay and neuter our pets but, if this latest trend hits the mainstream, we should probably just start sterilizing all humans. 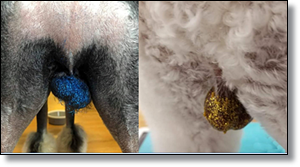 A glittered dog scrotum. That’s where we’re at as a society. We’re so far up Maslow’s pyramid that we’re not even dipping our own nutsacks in glitter. We’ve moved on to our dogs. How far removed from the threat of starving to death to do you have to be to pay to have someone do this? This is the type of thing that’s so unnecessarily extravagant that when the working class sees it they start getting an urge to cut off the heads of the rich.